As soon as I saw the DJI promotional video showing off their latest offering I knew it would be the one for me. The compact design, the convenience of size and the apparent ease of flying was just too tempting to ignore. But I’ve already got a drone I hear you say! Well yes, the upgrade from my first drone to the DJI Phantom 3 Standard was a fantastic step up and sparked an interest in aerial photography and also revitalised me back into video creation. But I soon realised the entry-level drone was exactly that…aimed at beginners and I was getting frustrated with its limitations. As the cheapest model DJI made, it lacked features and I often found that it would lose connection and instigate the ‘return to home’ function even if the drone was close by. So I had been considering upgrading anyhow, probably to the P3P (professional) which had a better camera, improved WiFi connectivity and more advanced flying features. It also meant I could keep the existing spare battery I bought for the P3S, saving a few quid too. But there was always the disadvantage with the Phantom series…their size. In order to safely carry the drone around it needed a backpack, and a large one at that. Walking along the street got me some strange looks, with one guy even asking whether I was training to go into the army! I would have loved to have taken the quadcopter on our holiday to Turkey but the size of the bag was just too big and would have certainly raised interest from the security guys. So when DJI announced the release of the Mavic Pro, I knew it was just what I was looking for. It is such a clever design, the size was small enough fit into a coat pocket and the features were so advanced for something so compact. The only thing was the price; almost three times the amount I paid for the PS3. So I hesitated…for a day! And then bit the bullet and preordered, paying the full price up front. 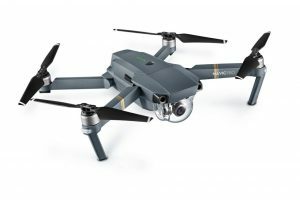 DJI gave an expected shipping date of mid-October but it was soon apparent they had wildly miscalculated the popularity of their latest offering and soon social media was muttering that there was going to be delays. To be fair to DJI they did state early on that orders would be on a first-come-first-served basis but I really didn’t expect it would have a dramatic impact on delivery times. Of course, mid-October turned into November and with no news on the impending shipping I was resigned to the fact that I would have to stick with the Phantom for the foreseeable future. I had been tracking other customers deliveries on a socially-shared spreadsheet but the shipments were erratic and difficult to judge when mine would be ready to send out. And then on Saturday I received the mail I had been waiting for; notice that the Mavic had been shipped. Yeah! I was given tracking information and an expected delivery date of Wednesday and so logged on to the DHL website and followed the parcel from China, through Hong Kong and Belgium, arriving into the UK via East Midlands airport on Sunday night before being shipped to Birmingham, ready for delivery. And on Monday morning I got a ‘parcel out for delivery’ notice, less than 48 hours from leaving Shenzhen. Incredible. And so last night I savoured the unboxing and managed maiden flight, albeit in the living room for just a minute. And I am so impressed! Unfortunately the rotten weather and shortness of the daylight hours meant no chance of flying properly today but hopefully I’ll get the opportunity to get out and do some flying on Friday as I have the day off. And then next weekend we’re off to Jersey for a few days to see Abby and I’m definitely including my little drone in my carry on bag. This entry was posted in Drone Stuff, Gadget Stuff, Photo Stuff, Photography Stuff, Quad-copter Stuff and tagged dji, drone, mavic pro, northantsdrone, quadcopter by Graham. Bookmark the permalink. Crikey! That’s a bit pricey. Best not dunk this one in the lake!! I look forward to seeing some ‘professional’ aerial photography now. Would have been useful a couple of weeks back, when I needed to get an antenna wire over the roof of the house. BTW, both hyperlinks point to the same site. Pricey, yes but worth it I’m certain. Thanks for mentioning the links, not sure what happened there. Now fixed and pointing to the correct video for the Mavic. Your website was down, this morning. You just need to give your old one to Tina, and then you could have races and dogfights and film them! Oh I wonder what happened with my site then?